Makaton is a communication system using signs, symbols, and speech, and has a long history of helping children and adults with a variety of communication difficulties to interact with those around them. If you love to sing – or if you’ve always wanted to try! – this could be just the course for you. We’ll explore some of the basic concepts around using signs and song together to aid communication, and learn to sing and sign a few well-known songs together. You’ll come away with a manual containing signs and symbols for ten nursery rhymes, and the knowledge of how to adapt the signs you know to your favourite songs. We are limiting numbers on these courses to a maximum of SIX people – this means that our tutor is able to spend more time with each participant, making sure they feel confident with the signing. The cost includes a participant manual with signs and symbol drawings. This is a 2.5 hour course which is completed in one session. 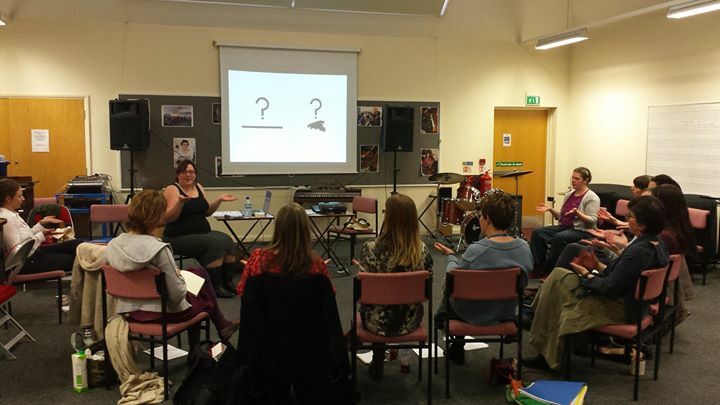 Why is a folk music organisation teaching Makaton?! Folk Arts Oxford believe the arts should be accessible for everyone, and are very proud to host the first Makaton-friendly festival in the UK. We are holding these workshops as part of our commitment to improving access to our events for people with disabilities.